“Education must inculcate respect for the wonderful diversities of our society. It is this diversity that has given us strength. Beneath this diversity lays the continuity and unity of our great nation” said Congress President Sonia Gandhi while addressing a function to celebrate the 105th birth day of Dr Shivakumara Swami jee at Siddaganga Mutt at Tumkur in Bangalore. “An open participative, representative democracy is its anchor and nothing exemplifies India’s diversity better than Karnataka itself, where people belonging to different culture, believing in different faith and speaking different languages have lived and worked for peace and harmony with each other to the ages. Education must instill a great respect to our secular heritage and tradition so that we can stand up to the forces that seek to divide us whatever form they may take” said the Congress President. Sonia Gandhi also asserted that education must lead to a deep sensitivity to social justice. “It is education that has led to the empowerment of weaker sections of our society that is so very apparent in many parts of our country especially Karnataka. Nevertheless, the sad reality is, and it still remains, that there are so many of our countrymen and women who face discrimination, who live in poverty and deprivation” said Sonia Gandhi. Sonia Gandhi: UP govt. blocks implementation of the schemes of Congress led UPA govt. For the first time in the recent assembly elections campaign in Uttar Pradesh, Congress President Sonia Gandhi and daughter Priyanka Gandhi attended a public rally together at Raebareli. Sonia Gandhi held all the non-Congress parties - BSP, SP and BJP - that ruled Uttar Pradesh in the past two decades, responsible for the bad situation and lack of development in Uttar Pradesh. The Congress President was critical of the state government for blocking the implementation of the Congress-led Centre's schemes and efforts to develop the state, particularly Raebareli and Amethi. “There was a deliberate attempt to discriminate against Raebareli. They obstructed every proposal by the Central Government for the benefit of this area. I can give you a number of examples to prove this” said Sonia Gandhi. To substantiate her allegation, Sonia Gandhi continued “The Central Government was planning to bring a hospital like AIIMS with all modern amenities at Lalganj but the state Government refused to provide the land for it. Similarly we had approved Rs. 240 crore for the drainage and sewerage in Raebareli, Rs. 170 crore for drinking water scheme and had made a proposal of Rs. 64 crore for the roads. But, the state Government did not take up the matter with the Centre”. “The state Government authorities denied permission to conduct an army recruitment camp in Raebareli. I want to ask you whether the youth in our Amethi and Raebareli have no right for jobs. Is there any fault with them?” asked the Congress M.P from Raebareli. Congress President Sonia Gandhi attended the 105th birthday celebrations of the highly respected Lingayat seer Shivakumara Swami at 'Siddaganga mutt' at Tumkur in Bangalore, which is considered to be one of India's oldest religious institutions. “May Dr Shivakumara Swaijee continue to inspire lakhs and lakhs of people across the state, across the country and indeed across the world in the cause of education, social service, philanthropy and spirituality,” said Sonia Gandhi paying respects to the seer. The Congress President added, “The primary education has been made a fundamental right. It is for all of us to ensure that this right is asserted and imposed so that all of India’s children from 6 to 14 receive free education”. 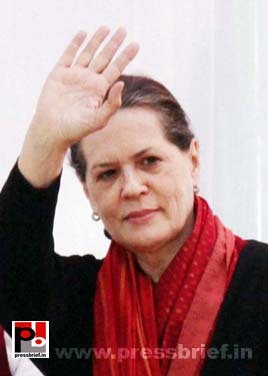 Striking an emotional chord with the people of Karnataka, Sonia Gandhi asserted that nothing exemplifies India’s diversity better than Karnataka itself, where people belonging to different culture, believing in different faith and speaking different languages have lived and worked for peace and harmony with each other. Sonia Gandhi also asserted that education must inculcate respect for the wonderful diversities of our society. “It is this diversity that has given us strength. 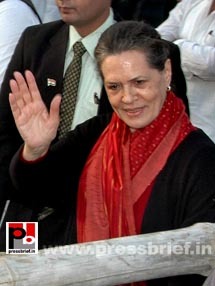 Beneath this diversity lays the continuity and unity of our great nation” stressed Sonia Gandhi. Bangalore: Congress President and UPA Chairperson Sonia Gandhi is attending the Guruvandana programme of Siddaganga Mutt in Tumkur. The occasion was to pay respects to Shivakumara Swami jee on his 105th birthday celebrations. “May Dr Shivakumara Swaijee continue to inspire lakhs and lakhs of people across the state, across the country and indeed across the world in the cause of education, social service, philanthropy and spirituality” said Sonia Gandhi. Mumbai: Congress General Secretary Rahul Gandhi visited various places in the drought-hit Satara district in Maharashtra Saturday morning. Maharashtra Chief Minister Prithviraj Chavan and other senior ministers were also along with him. Rahul Gandhi visited the Zalshi Talao, which is one of the water sources in the district. He is also scheduled to go to nearby Bijwadi to take a look at state government sponsored employment guarantee schemes being implemented there among the drought-affected people of Satara and also will visit the Pangari fodder depot in the district which supplies fodder to a large cattle population in the region. Congress star campaigner Priyanka Gandhi is addressing an election meeting in Raebareli. She had campaigned for Congress Raebareli, the parliament constituency of Congress President Sonia Gandhi, and urged people to support Congress for better development in Uttar Pradesh. Rajiv Gandhi had said, “I don’t feel betrayed; it is not that easy to cope with power and when criticism is motivated and irrelevant it does not affect me”. In an interview, Sten Lindstrom, the former head of Swedish police who led the investigations in the alleged illegal payoffs says that there was no evidence to suggest that former Prime Minister Rajiv Gandhi had taken bribe in the Bofors deal. Rajiv Gandhi always spoke his mind and was addicted to progress. He believed that it was the lack of being able to apply technology at the right point. He intended that it should go to the service of weaker section of the people. In an interview, Sten Lindstrom, the former head of Swedish police who led the investigations in the alleged illegal payoffs says that there was no evidence to suggest that former Prime Minister Rajiv Gandhi had taken bribe in the Bofors deal. Rajiv Gandhi believed in scientific temper which he described as removing the fear of unknown which keeps people back and stops people from moving ahead. In this direction he realized that India had missed the industrial revolution and it cannot miss the computer revolution. In an interview, Sten Lindstrom, the former head of Swedish police who led the investigations in the alleged illegal payoffs says that there was no evidence to suggest that former Prime Minister Rajiv Gandhi had taken bribe in the Bofors deal. In an interview, Sten Lindstrom, the former head of Swedish police who led the investigations in the alleged illegal payoffs says that there was no evidence to suggest that former Prime Minister Rajiv Gandhi had taken bribe in the Bofors deal. “There was no evidence that he had received any bribe.. Many Indian institutions were tarred, innocent people were punished while the guilty got away”, said Lindstrom. Priyanka Gandhi Vadra is talking to the people during her Congress campaign in Uttar Pradesh’s Raebareli. The people of Amethi and Raebareli in the state of Uttar Pradesh have a special affection for Priyanka Gandhi Vadra. Further every visit of this charismatic young Congress leader boosted the confidence of the Congress workers. Priyanka Gandhi Vadra is addressing a gathering in Raebareli as part of her Congress campaign in Uttar Pradesh. Priyanka Gandhi with her attractive smile and highly interactive style is the favourite of the people in Uttar Pradesh, especially in Amethi and Raebareli. Every visit of this charismatic Congress leader boosted the morale of the Congress workers in the state. Priyanka Gandhi Vadra while speaking at an election meeting at Raebareli (Bachharawan) as part of her campaign for Congress said that the non-Congress Governments in U.P did nothing for the development of UP. She said that the negative and opportunistic politics in the past two decades took the state backwards and developments reached a standstill. Priyanka Gandhi urged people to support Congress for the welfare of the people and progress of the state. Support the Congress and elect Congress candidates with a huge majority to strengthen the hands of Sonia Gandhi, the Congress President and the Member of Parliament from Raebareli, Priyanka Gandhi Vadra requested voters. She was addressing an election meeting at Bachhrawan in Raebareli. Priyanka Gandhi urged people to support Congress for the welfare of the people and progress of the state. Priyanka Gandhi Vadra while speaking at an election meeting at Raebareli (Bachharawan) said that the non-Congress Governments in U.P did nothing for the development of UP. She said that the opportunistic politics in the past two decades took the state backwards and developments reached a standstill. Priyanka Gandhi urged people to support Congress for the welfare of the people and progress of the state. Priyanka Gandhi Vadra while speaking at an election meeting at Sultanpur as part of her campaign for Congress said that the non-Congress Governments in U.P did nothing for the development of UP. She said that the negative and opportunistic politics in the past two decades took the state backwards and developments reached a standstill. Priyanka Gandhi urged people to support Congress for the welfare of the people and progress of the state. Support the Congress and elect Congress candidates with a huge majority to strengthen the hands of Congress Priyanka Gandhi Vadra requested voters. She was addressing an election meeting at Sultanpur. Priyanka Gandhi urged people to support Congress for the welfare of the people and progress of the state. Priyanka Gandhi Vadra while speaking at an election meeting at Sultanpur said that the non-Congress Governments in U.P did nothing for the development of UP. She said that the opportunistic politics in the past two decades took the state backwards and developments reached a standstill. Priyanka Gandhi urged people to support Congress for the welfare of the people and progress of the state. As part of her Congress campaign, Congress President SoniaGandhi addressed a huge public rally in Punjab and said that the Akali-BJP Government in the state is not at all serious to implement the policies of the Congress led Central Government for the benefit of the poor. "The Congress-led UPA Government has made a lot of policies to provide support to the common man. These policies can improve the condition of the lower sections of the society and give them a chance to rejoice," said Sonia Gandhi. Sonia Gandhi further said the Congress-led Central Government has been providing financial assistance without any discrimination to the entire states under various central schemes. "Congress-led central government has been sending funds without any bias to the entire states for developmental works, but the Punjab Government did not pay serious attention to these developmental schemes. For example, the funds sent for the Mahatma Gandhi National Rural Employment Guarantee Act that aims at enhancing the livelihood security of people in rural areas by guaranteeing hundred days of wage-employment, was not properly utilized," added Sonia Gandhi. Appreciating Gurdaspur the Congress President said "Gurdaspur is known for its many achievements. Specifically, the quality of education here is quite high and increasing at a steady pace. In 2001, the literacy rate here was 73 percent, which went to more than 81 percent by 2011”. “I believe that the future of the people of a city, who give high importance to education, can only be bright. So, it can be said with confidence that Gurudaspur is moving ahead on the path to progress and development on its on," Sonia Gandhi said.